If you are a regular reader of my blog you will know that I have a tendency to see "Boing Balls" in everyday objects. 😉 A few days prior to my recent trip to California to attend Dave Needle's Memorial service I took part in a football practice session for the first time in about 12 years. 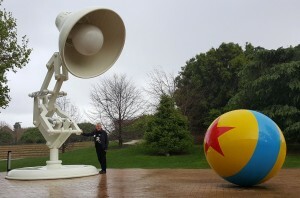 You are probably wondering what has this got to do with "Boing Balls" but bear with me and read on. I arrived at the football pitch at the set time only to find the practice session already under way. I quickly put on my football boots and joined the short game. Some 45 minutes later, with cramp in both calfs. I managed to get back to my car to drive home. When I got home I had to telephone my wife from our garage to help me out of the car, much to her amusement! 😉 This was on a Tuesday and by the time of my flight to San Francisco on the Friday my legs had more or less recovered and I was walking almost normally. 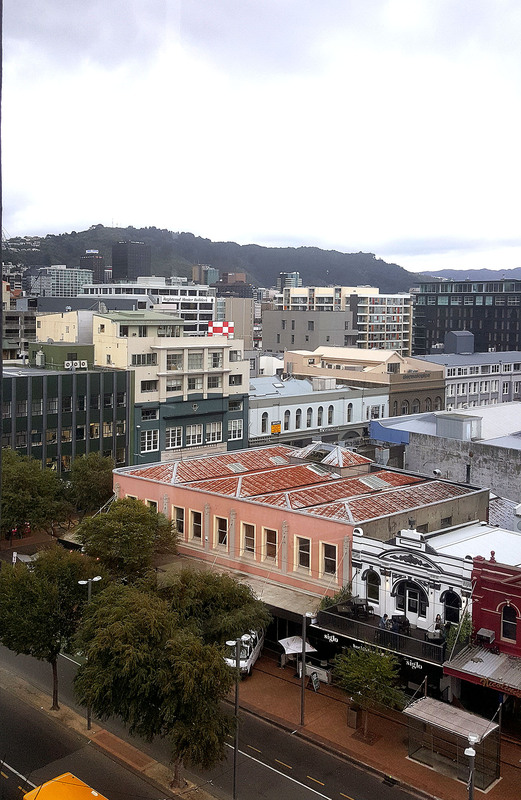 Since the day starts in New Zealand, I was able to leave Wellington on Friday evening and arrive in San Francisco on Friday morning. As I was staying with RJ Mical, who is of course an original Amiga developer and life long friend and workmate of Dave Needle, I bought a small present for his wife Caryn and a bottle of malt whisky for RJ. 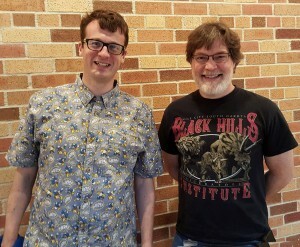 Fellow Amiga developer Glenn Keller was also staying along with technology blogger Adam Spring. Dave's Memorial service took place on Saturday morning and was followed by an afternoon reception and then evening party at The Gate where Dale Luck streamed videos of Dave and RJ being interviewed by EA Founder, Trip Hawkins on release of the 3D0 video games console which Dave and RJ jointly developed. Glenn drove Adam and me back to RJ's house and we talked and drank into the early hours, finally crawling off to bed at 5am on Sunday morning, after finishing off the bottle of whisky I bought for RJ (sorry RJ). I managed to get up at 12 noon to find that everyone else had also risen late as well, apart from RJ who is always an early riser. We had volunteered to help move all the ground floor furniture into storage containers to clear the area in preparation for RJ's upcoming birthday party (and for the major house remodelling project which is due to take place after that). So myself, Adam and Glenn together with Chris Collins, who stayed over after the all-night session, began moving the furniture into a number of small container located outside the front of the house. Most items were quite easy to move, but some like a table top video game machine were very heavy. It was going quite well until we began moving Caryn's prized dining table. We dismantled it as much as possible to reduce the weight and with Adam at the front and me in the middle and Glenn at the back carried it on its side, carefully navigating the obstacle course to the waiting containers outside the house. All was OK until Adam, who was walking backwards, tripped on a brick steps and fell slowly backward, losing his grip of the table which was heading for the edge of the step. Instinctively I thrust out my right leg and caught the table with my foot preventing it from hitting the edge of the step. Fortunately Adam was relatively unhurt and the table was saved and no harm done, or so I thought. The next day I was flying back to New Zealand and as I was striding through SFO airport towards my departure gate I felt a sudden twang in my right calf accompanied by an sharp intense pain and I immediately began limping like an old man (hey who said if the cap fits!). Eventually I made it to the gate and when the call went out for people who needed a little extra time to board the plane first I was tempted to put up my hand and limp to the front! 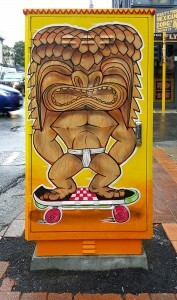 Anyway, I arrived safely back in New Zealand but was still limping badly. One thing that always impresses me when I visit San Francisco is the sheer amount of innovation and ground breaking development that appears to be happening on every street corner. On first glance it seems like everyone is either working for Google, Apple or Facebook (or one of the dozens of other high-tech digital businesses headquartered in the Valley) or has just joined a new disruptive startup company looking to displace the digital behemoths from their lofty perches. If you have ever watched Silicon Valley, the US TV sitcom, you will get a feeling for the technology, brains, competition and money that is focused in the Santa Clara Valley which accounts for one-third of all venture capital investments in the USA. It was interesting therefore to attend Dave Needle's evening memorial party at The Gate, a 750,000 ft2 creative space for the Art, Tech and Maker community based at the West Gate Center in San Leandro, which forms part of a 24-acre property transformed into a unique accelerator and incubator hub. 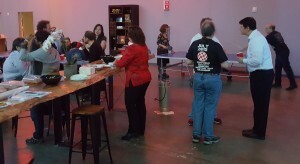 Sam Dicker playing table tennis - honest! 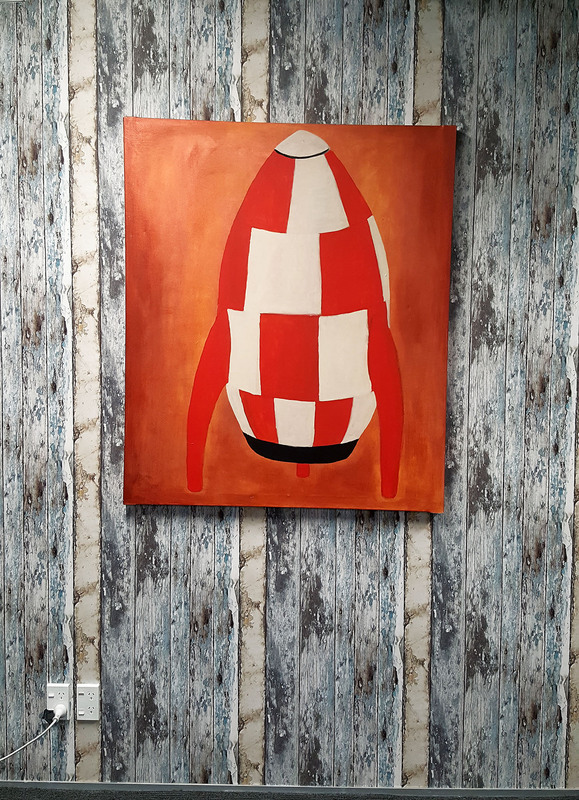 One of Dave's most recent projects was working with his long time friend Tracy McSherry, the CEO of PhaseSpace whose company just happened to be located at The Gate. PhaseSpace are leaders in highly accurate real-time motion tracking and position sensing technology. Since Tracy had organised the evening memorial party at The Gate it also meant that we got to test some of the latest 3D VR technology that Dave Needle had helped to create. 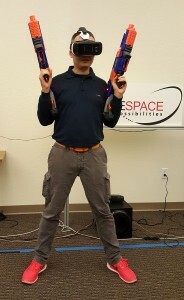 I, along with Michael Battilana, Adam Spring and Chris Collins got to try out PhaseSpace's Head Mounted Display (HMD) and tracking technology by shootings swarms of alien space bots in a 360 degree 3D virtual world. 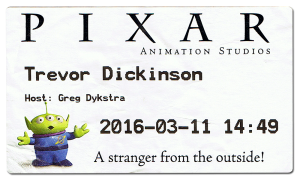 It was great fun, extremely impressive and best of all I experienced none of the usual motion sickness I get when I've tried VR headsets or HMDs in the past. I don't think Adam was too impressed though when I decided to stop shooting the space bots and began targeting his 3D virtual Avatar. 😉 According to Tracy, "The whole point of VR is to make things that were impossible come to life. 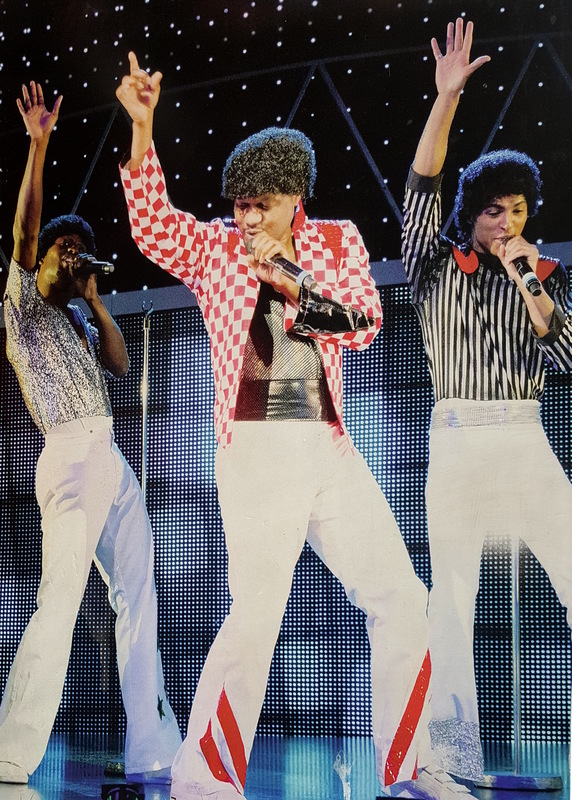 The actual reality has been a bit slower than hoped, but after working on this for 30 years, I'm very happy to see it's all coming together." It's good to know that Dave Needle had contributed to this effort prior to his untimely demise. 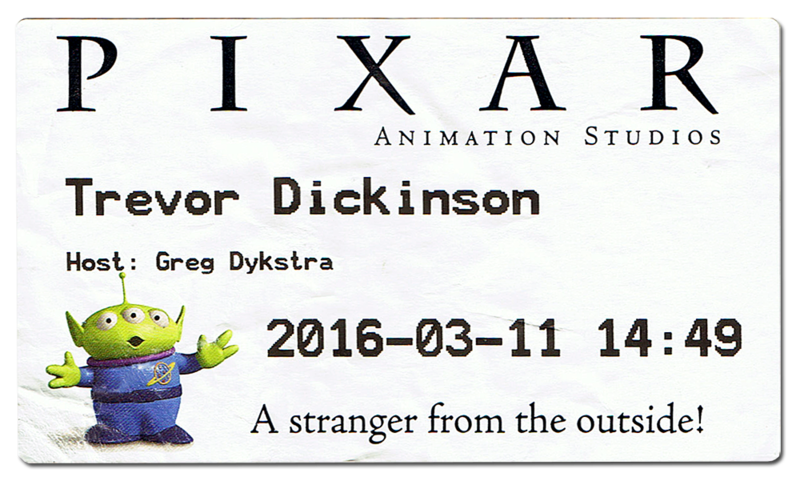 While I was in San Francisco I also managed to tag along with Adam Spring on a visit to see Greg Dykstra of Pixar fame. Adam, apart from being an active technology blogger & podcaster, is a pretty smart guy in his own right. 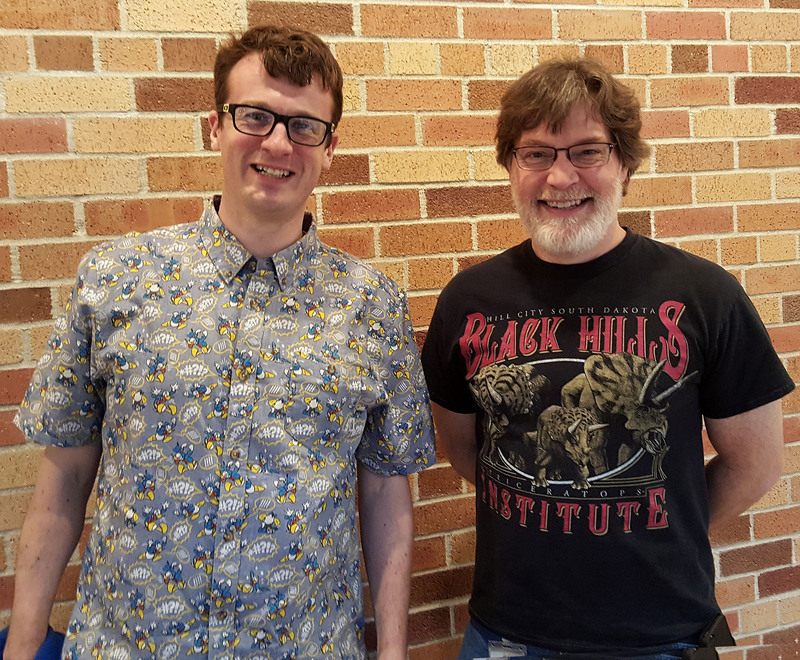 He is working on a project for Duke University and was seeking Greg's advice on some technical issue related to 3D scanning and digital sculpturing. Greg of course is known for his amazing sculpting talent and has created many of the clay models for various Pixar Movies such as Finding Nemo, Brave and The Good Dinosaur etc. However, what many people probably don't realise is that Greg, through his startup company PaleoMill, is also an expert in 3D scanning and printing of dinosaur fossils. He uses using 3D-scanning technologies to digitally assemble fossil material and uses 3D-printers to create scale-model reproductions of fossils. However even more unusual, Greg also has connections with Star Trek Continues, the multiple award winning, fan-created web series both as a writer and actor. 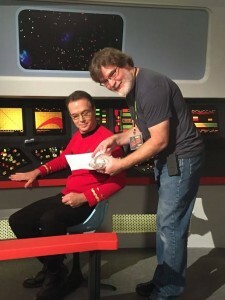 Star Trek Continues is a non-commercial web series which continues the 5-year mission where the original TV series left off and has no affiliation or connection with the Star Trek franchise. 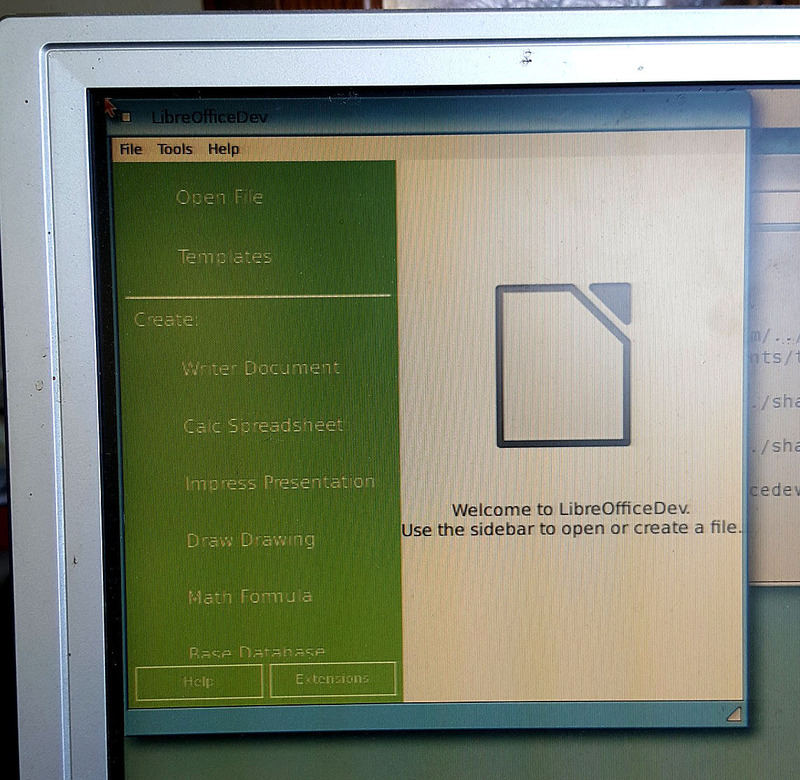 AmigaOS 4 is going critical captain! 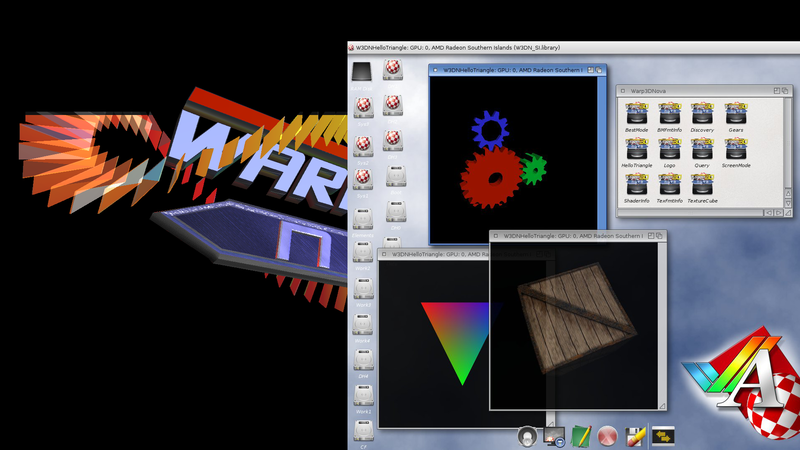 If you haven't seen the news item, Warp3D Nova is a huge leap forward over earlier Warp3D and MiniGL implementations. It delivers shader-based 3D graphics acceleration along with per-pixel lighting and fluid rendering of larger vertex arrays as well as many other advanced graphics features. 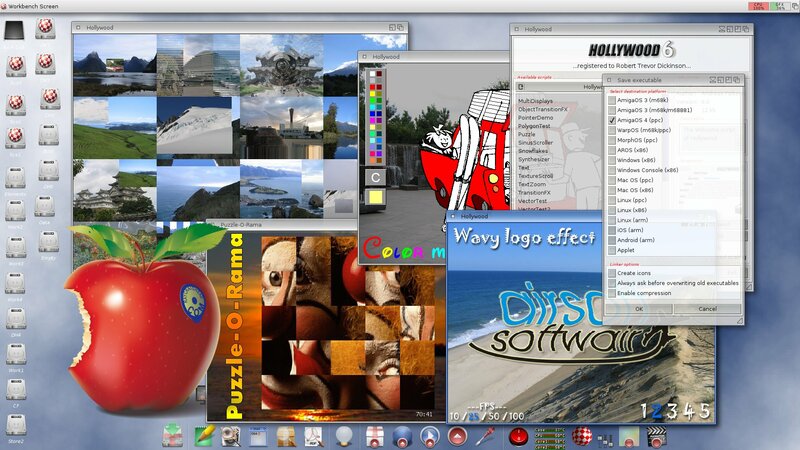 The addition of programmable shaders gives AmigaOS 4 developers an exciting new world of graphics possibilities. A-EON has also commissioned Daniel "Daytona675x" Müßener to develop the complementary OpenGL ES 2 wrapper and several developers are now working on new games to utilise the raw power of the Warp3D Nova graphics subsystem. Apart from Warp3D Nova, the ESP bundle also includes many other utilities and commodities including MultiEdit, ClipViewer and X-Dock as well as updated versions of MultiViewer, AmiDVD, Tunenet, Partition Wizard and SmartFilesystem2 and a whole host of other gadgets, classes and datatypes. ESP is available to purchase as a digital download from AMIStore and for Amigans who prefer physical media, a nice CD boxed version will also be available to purchase in the near future from ACube Systems, ALINEA Computer, Amedia Computer France, AmigaKit, RELEC and other participating Amiga dealers. For all you 68k Amigans, don't despair, a Classic 68K version of ESP is also in the works. Look out for more news on this later. 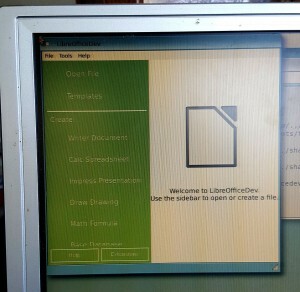 If you saw my presentation at Amiwest you may have heard my "Content, Content Content" speech about the desire of A-EON Technology to create more quality software content for both PowerPC and 68k AmigaOS systems. 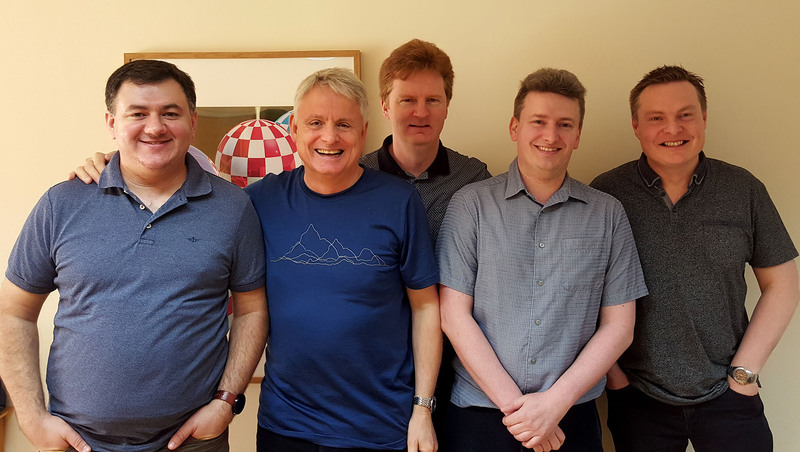 As part of this commitment we purchased many Classic and Next-Generation AmigaOS titles and utilities with a view to upgrading and improving them. Some like Personal Paint, Tunenet and the Ringhio Notificatons Server etc, have already been updated and released. Others are still very much WIP. We are continuing to fund the development of many new applications and at the latest count we now have 18 developers engaged in paid development working on dozens of software projects. No, not the song which featured in the 1937 movie Hollywood Hotel, but the excellent Hollywood cross platform multimedia oriented programming language created by Andreas Falkenhahn of Airsoft Software. 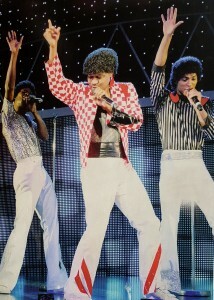 Version 6.1 was released on March 13th, both as a digital download and on CD. As I prefer to have the physical media, call me old-fashioned, I ordered the CD which I received at the end of March just before I left on my international travels so I didn't get a chance to install and test the new version. Long gone are the days when Hollywood was limited to the AmigaOS. These days Hollywood runs on pretty much every platform and OS. 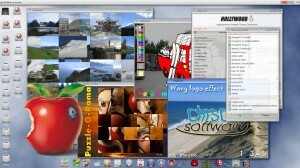 There are versions for AmigaOS 68k and PowerPC, AROS, MorphOS and WarpOS as well as Android, Windows, MacOS and Linux. Best of all, when you buy Hollywood you get a license for all the platforms that Hollywood supports and you can cross compile native executables for most of the platforms even if you don't own them. 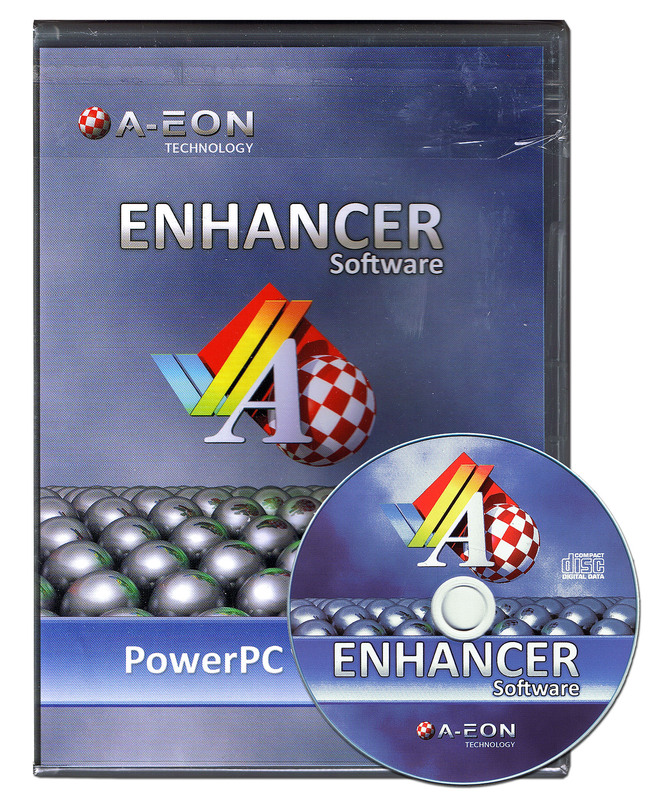 For example you could create your multimedia extravaganza in AmigaOS 4 and cross compile the executable to play on a Windows or Mac device or vice versa. A list of the new feature in v6.1 can be found on the Hollywood website. I've received numerous enquiries about the availability of the AmigaOne X5000 system. 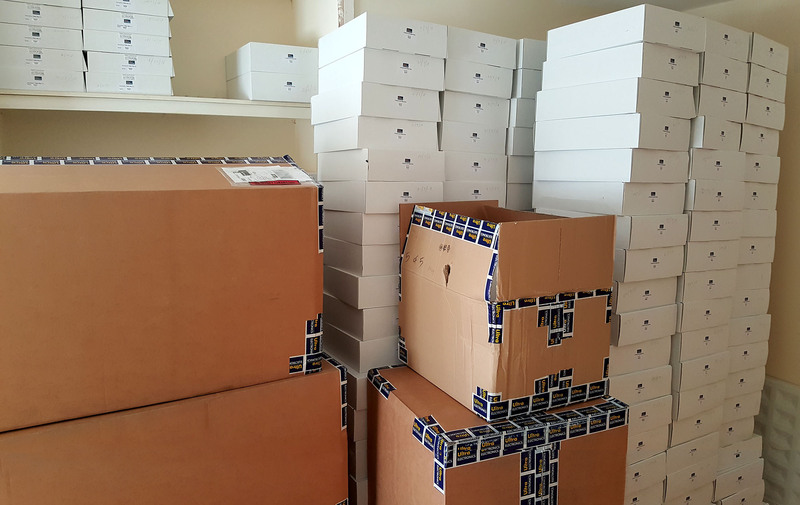 As you probably know the Cyrus boards have been in stock for quite some time with new shipments of boards arriving from Ultra Varisys almost weekly. 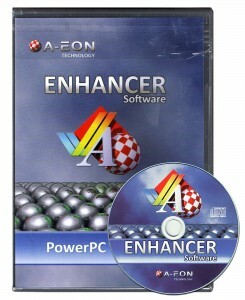 We are just waiting for the final release version of AmigaOS 4.1 from Hyperion Entertainment and then we will be good to start shipping new AmigaOne X5000/20 systems. As with the AmigaOne X1000 "First Contact" system we will release an "early bird" model, this time entitled "Close Encounters" which we be supplied with the first version of AmigaOS 4.1 specifically configured by Hyperion Entertainment for the AmigaOne X5000. I must admit that does sound a little scary! 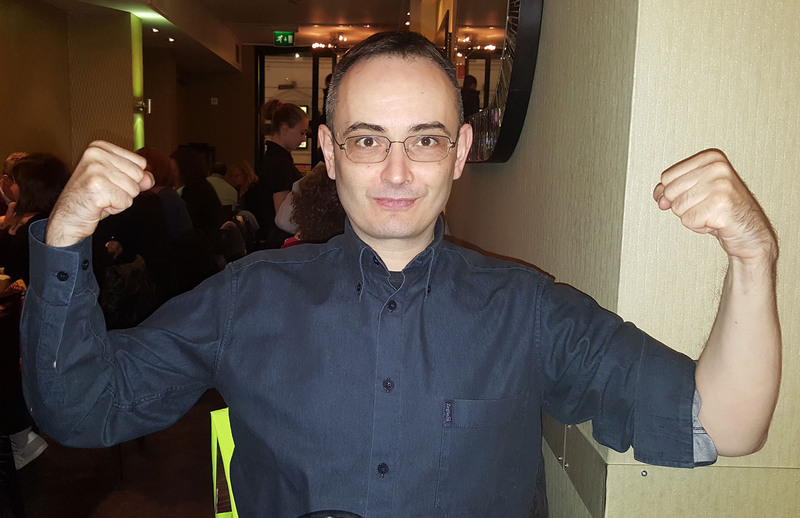 😉 No, I am not talking about maximum readiness for a nuclear war or other imminent threat but the first ever developer conference featuring A-EON's core Linux support team which took place in Cardiff over the weekend of the 23rd/24th April. Key members of the team travelled from all parts of the globe. Alex Perez flew in from San Francisco, California while Pat Wall caught the relatively short flight from Kilkenny in Southern Ireland. Darren drove down from Scarborough in Northern England. I flew in from Wellington, New Zealand and of course Matthew lives in Cardiff. We also had the part-time Skype presence of (John Paul) Adrian Glaubitz, a Debian developer, who has volunteer to work on the official powerpcspe Debian Sid build for Tabor. 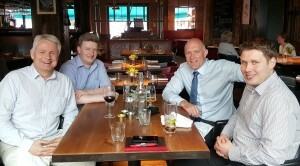 Unfortunately two key member of the Linux team were unable to attend. Christian Zigotzky had work commitments, although he did travel to Cardiff in March to help set up the Linux installation on the Tabor motherboard for supply to the beta testers. Julian Margetson couldn't travel without closing the family business which is an essential service in the tiny island of Montserrat. As it turned out it was an action packed weekend which saw progress with Cyrus, Tabor and A.L.I.C.E. projects. It was also a lot of fun. 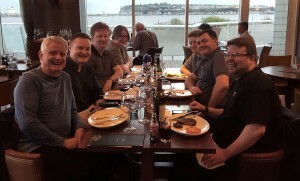 The Devcon itself was split into formal meetings and practical sessions with a special celebration dinner on Saturday evening at the St David's Hotel restaurant situated on the waterfront overlooking a very wet and windy Cardiff bay. Pat Wall setting up A.L.I.C.E. Following the formal session, Pat Wall worked on the A.L.I.C.E. configuration for the new x86 Laptop that has been selected for the first commercial release. 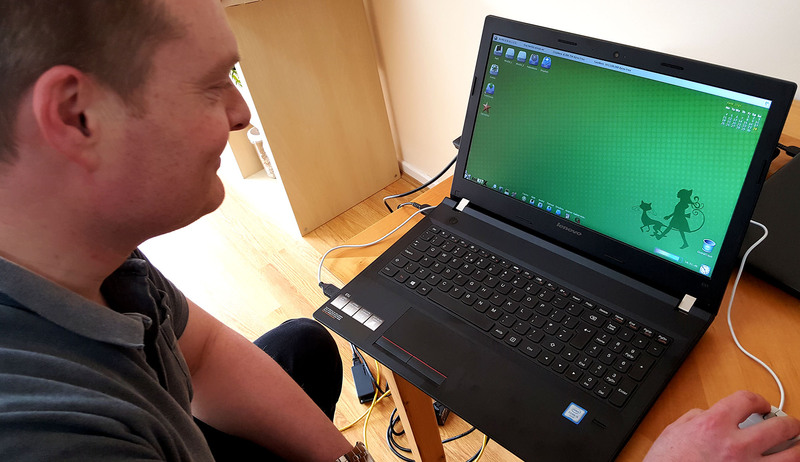 Alex and Darren set up a standalone Tabor server to allow 24/7 remote internet access to speed up support for powerpcspe package builds. The server is now up and running and combined with Adrian's Tabor machine it has really helped speed up the build process. Alex actually brought his Cyrus tower system to Wales in his suitcase and amazingly it survived the journey to the UK and back home to the USA. 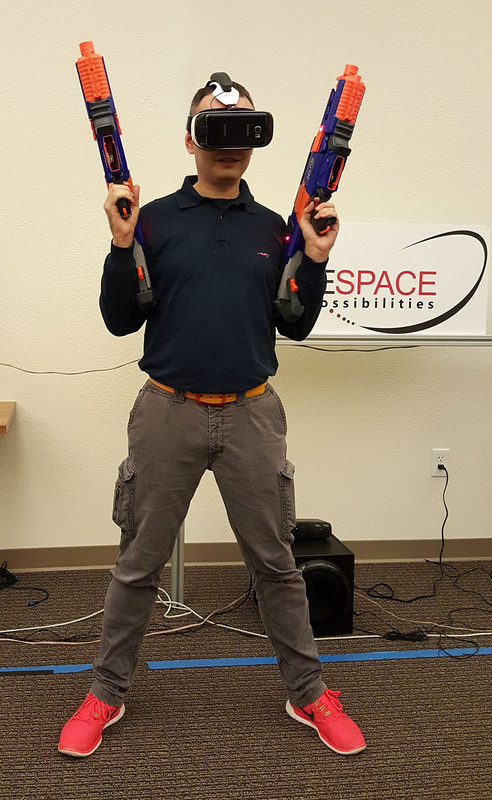 After the serious work, the team even found some time to play around with some interesting Cyrus hardware. One of the aims of the core Linux team has been to help get A-EON's hardware supported by the mainstream Linux PowerPC developer community. Thanks to the efforts of Alex Perez, the Cyrus+ motherboard is now officially supported in the Linux PowerPC kernel build. Again thanks to Alex the AmigaOne X5000 is now a supported architecture under FreeBSD. Although the Welsh weather was not the best, a great time was had by all and in addition to the sumptuous dinner at St David's Hotel the team enjoyed eating traditional British fish & chips and Dominos pizza. It was agreed by all that the Devcon1 was a great success. 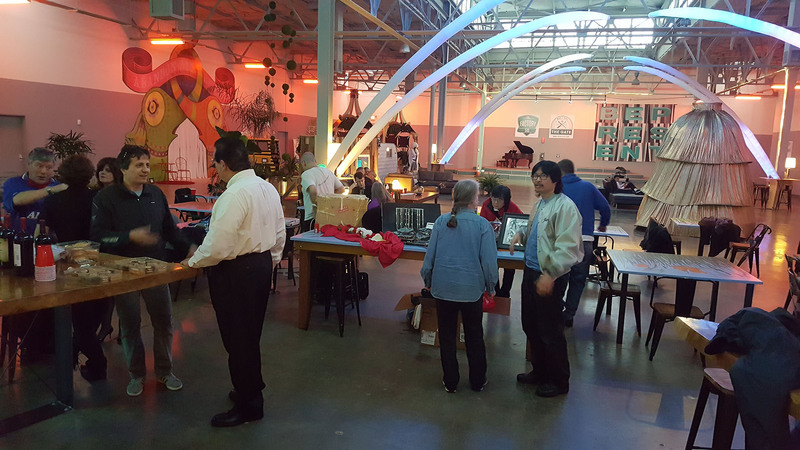 It was also decided that Devcon2 will be an AmigaOS event. The location and date are still to be decided. After Defcon1, Matthew Leaman and I visited our hardware developer Ultra Electronics (Varisys) as they are now called, for our annual review meeting with Paul Gentle and Marcin Kukielka. We discussed the status of our current hardware development projects along with manufacturing and delivery schedules. I'm pleased to report from a hardware perspective we appear to be in very good shape with some exciting times ahead. 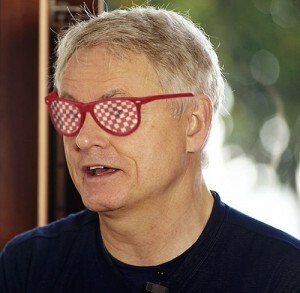 Over lunch, after the formal part of the meeting, Paul revealed a special "Steve Jobs" story that I had not heard before. Cast your mind back to 2008, to a time before the AmigaOne X1000 or the Nemo motherboard. If you have followed the development history of the AmigaOne X1000 you will probably know that Varisys were commissioned to design a new AmigaOS 4 motherboard, code-named Nemo, which was based around the PA6T-1682M CPU, a high performance, power efficient 64-bit dual-core PowerPC CPU created by Palo Alto Semiconductor (PA Semi). You might even know that the motherboard's development was almost scuppered when Apple purchased PA Semi. 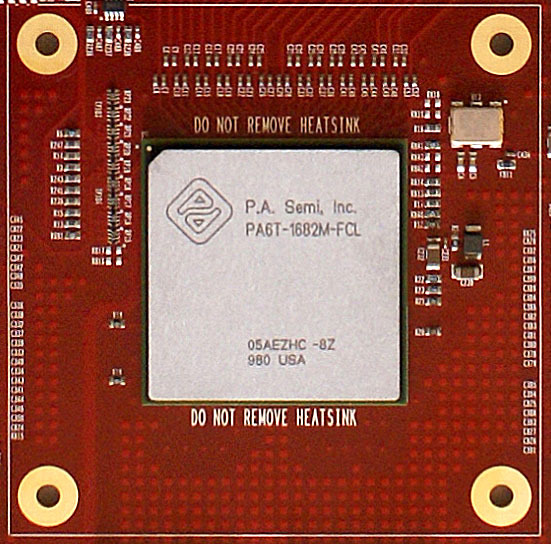 Shortly after the acquisition Apple announced the PA6T CPU would only be sold to preexisting military and industrial customers who already had orders in place and after that the line would be discontinued. 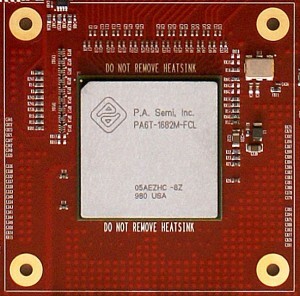 Apparently Apple purchased PA Semi for its low power electronics skills and not for its CPU architecture. What you probably don't know is that Paul Gentle wrote a personal message to Steve Jobs asking him to reconsider the decision not to supply the PA6T CPU for the Nemo development. He received a one word reply from Jobs which was short and to the point which simply said "Sorry". Gentle refused to give up and wrote an impassioned email to Jobs stressing the future success of Varisys, a small British development company, depended on the supply of the PA6T CPU for the Nemo development project. This time Jobs sent a more lengthy but still negative reply saying that if the future of Varisys depended on the supply of PA6T CPU for one project then their business model was broken. It looked like the end of the line for the Nemo motherboard. However, not too long afterwards the PA Semi CTO contacted Gentle to say that he had been given approval to supply the PA6T CPU for the project and the Nemo development was back on track. Whether Jobs intervened on our behalf or not we will never really know. Who would have thought? 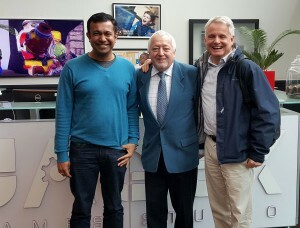 I also had time to take a trip to Cambridge with David Pleasance, the former Joint MD of Commodore UK, to visit Jagex Games Studio, the developers of RuneScape, a successful fantasy massively multiplayer online role-playing game. We met with Saumitra Ganguly, Jagex's VP of Technology and afterwards I was introduced to Rod Cousens, Jagex's CEO and ex head of Activision. 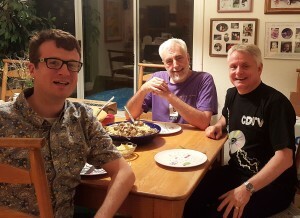 David and Rod are old friends from their Commodore/Activision days and it didn't take long before we were discussing the good old days of Commodore and Amiga gaming! Rod said that back in the day Activision always launched its new games on the Amiga first. Ah, those were the days. 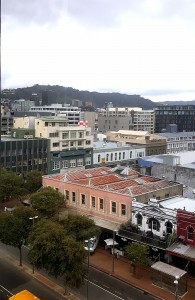 While attending a recent meeting in Wellington I just happened to look out of the window and spotted a red & white checked tower on a rooftop in the distance and if that was not enough when I was walking back to my car I spotted this image of a Tiki riding on a red and white checked skateboard. Now I've seen everything! Is it just me or are there really Boing Balls everywhere? Sorry I missed you this morning. It was really good meeting up with you again at RJ's for Dave Needle's memorial weekend. Downing a bottle of whisky and the impromptu furniture removal were an added bonus. I think the jet-lag, lack of sleep, self-abuse and heavy lifting have taken their toll. When I was walking to to the lounge I pulled a muscle in my calf! At least I will have a valid excuse to get on first when they call for anyone who needs a little extra time to board!